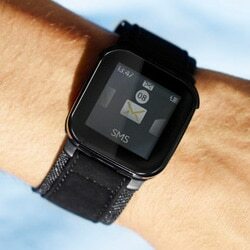 LIVEVIEW: Is Sony Ericsson's wearable micro display a hint of things to come for NFC? WRIST WATCH: The idea of using a peripheral device such as a watch or bracelet to conduct an NFC transaction, while keeping your mobile phone safely in your pocket, is gaining ground. A paper by Swedish master of interaction design student Matthew Goble has found that a wristband with the NFC functionality fitted into the inner wrist area is the most ergonomic solution and the new LiveView micro display from Sony Ericsson shows how it could be done. PAY BY DOGTAG? The US Dept of Defense has issued a request for information on the possibility of adding contactless EMV prepaid card functionality to the smart card-based ID card it issues to military personnel and staff, sparking speculation that the department could drive forward adoption of NFC-compatible payments in the US. POSITIVE IN POLAND: Mobile operator PTC and online bank Inteligo‘s NFC trial in Poland has been judged a success, Rzeczpospolita reports. Inteligo is now looking at the possibility of making NFC microSD cards available for customers to purchase. LUNCHEON VOUCHERS: Clear2Pay and Edenred (previously known as Accor Services) have rolled out an electronic luncheon voucher system based on dual interface contact and contactless smart card technology. The move follows a successful two year trial in Belgium testing the use of contactless cards and NFC to replace paper luncheon vouchers. SAN FRANCISCO MEETING: The NFC Forum is holding a one day Spotlight Session for Developers in San Francisco on Friday 5 November. Tickets cost US$75 for NFC Forum members, $250 for non-members and $50 for students. IPHONE CHECKOUT: Supermarket giant Tesco has developed a proof of concept barcode-based iPhone app that points the way to how NFC will be used to improve the shopper experience in supermarkets. The app allows shoppers to scan items they put into their basket as they shop and then quickly and easily check themselves out of the store without having to re-scan their items. TRAIN TICKETING: Masabi has signed a deal with thetrainline.com for a UK national mobile rail ticketing solution, based on barcode technology. The system will allow users to buy and display UK rail tickets direct from their mobile phones for any route on the National Rail network without having to visit ticket offices or ticket machines and is due to launch before the end of 2010. A video showing the Masabi system in action can be seen on YouTube. HOTEL DOOR LOCKS: Valentines Resort & Marina in the Bahamas has become the latest hotel to install VingCard‘s NFC-compatible Signature RFID electronic door locks. A video showing the technology in action can be seen on YouTube. LOCATION-BASED AD GUIDELINES: The Direct Marketing Association (DMA), Internet Advertising Bureau (IAB) and Institute of Practitioners in Advertising (IPA) are all working on guidelines and regulations for the fast emerging location-based advertising market. “Fear among consumers that sharing their location amounts to a loss of privacy is the biggest obstacle the ad industry has to overcome,” Marketing Week reports. ADVISOR VISIT: Alec Ross, Hillary Clinton’s senior advisor for innovation, has visited Swedish mobile payments and NFC specialist Accumulate with Matthew Barzun, the US Ambassador to Sweden. Ross saw demonstrations of Accumulate’s solutions for mobile payments at the point-of-sale, person-to-person money transfer, mobile payments at vending machines and secure login using the mobile device as a security token. SK C&C HIRES FIVE: The US arm of Korean IT firm SK C&C, which earlier this month signed an NFC payments platform deal with First Data, has recruited five new staff. Jun S Hong is the new CTO and SVP of product development, Jon Squire is SVP for business development and strategy and was previously SVP of mobile payments at mFoundry, Steve Bacastow is SVP for service and delivery, Charles Wiggs is VP of sales and Kevin Zhu is VP of product management and technology development. Zhu previously led product and technology development for mobile payment and mcommerce at US mobile network operator Sprint.